While we were crabbing one night during our beach vacation, my 10-year-old daughter suddenly turned away from her sister and cousins’ joyful antics. They had managed to catch a ghost crab and were admiring it in the bucket. Although it would be turned loose shortly, Avery couldn’t bear to watch. The next night, it was the fishes the kids were catching in their colorful pails that troubled her. I remained silent about “herds” and just let her keep talking. I could see this topic was important to her, and she was quite distressed. “What if that captured fish can’t find its family when he gets put back in the ocean?” she cried. I understood completely. My heart is wired that way for animals, too, but Avery would soon make a profound statement indicating just how much she cares about animals. It happened the next evening when our families went to dinner. While seated at the table with eleven others, Avery studied the plated food that had just arrived. Looking ill, she discreetly asked me to accompany her to the restroom. I was not expecting this so I was not prepared with a response, but I knew there was only one correct response: Support. I could see the determination in her eyes, and I would not stand in her way. The relief in my child’s face indicated that was a good response. The next day, her excitement was palpable as we searched online food lists and reviewed vegetarian guidelines. Huddled together at a little coffee shop, we talked about how we would ensure she got proper nutrition and sources of protein. Avery eagerly accepted my request for help with food prep and meal planning. As we were about to wrap up our research, she suddenly became solemn. “Will it make a difference? I mean, everyone else around me will still be eating meat. Can one person not eating meat still help animals?” she asked. I don’t think it was any coincidence that Avery and I came back to the vacation rental and began a special project with her sister and nephews that has intrigued me ever since I read about it. The movement is called Kindness Rocks. Sitting on the back porch of our rental that rainy afternoon, I explained to my daughters and nephews that people throughout the world are decorating and hiding Kindness Rocks for others to find. Each rock contains a positive word or message. Before we got started decorating, we talked about what messages we could write on our rocks. We also talked about what finding one of these rocks would do for someone’s heart or outlook on life. On our last day of vacation, the kids and I walked into the little beach town to hide the rocks. I watched as they carefully considered placement of the rocks for people to find – in trees, on street signs, on ledges, and on outdoor tables at the coffee shop. Interestingly, not one child mentioned holding on to a rock they had put much time and love into—they wanted to give them away. I also noticed there were no squabbles or complaints during that time. Happy moods prevailed as they imagined someone finding their rock and how it might impact their day. I watched him gently roll the colorful rock in his fingers smiling as he took in the uplifting message: Thank You (front) For Being You (back). Little Evan had set his special rock there four hours earlier. As the man turned to leave, he put the rock back down on the table. It wasn’t that he didn’t want it — that is just simply how kindness works. After you see it, feel it, or experience it, you feel empowered to pass it on. You feel responsible to keep kindness alive. Over the past three weeks, Avery has slowly been telling friends and even strangers she is a vegetarian. Each one has been supportive and curious. I watch as she proudly explains what it means and why it’s important to her. I notice she is happy, happier than I have seen in a while as she follows her heart’s calling. Each time she sits down to her non-meat meal or cuts vegetables for our meals, I am inspired by her message. In fact, I could no longer bear to sit at the table and drink chemicals from a soda can. My nephew Sam saw me guzzling a Coke Zero in the vacation rental after I’d promised him at his grandfather’s funeral that I would quit. Between my broken promise to Sam and Avery’s commitment to the lives of animals, I am successfully breaking a long-held diet soda addiction. I am six days diet soda free, and I sense profound changes happening in my body. Most remarkably, I have slept through the past two nights without any night terrors. This is profound. My nighttime anxieties have been debilitating for several years. Who knew the soda was causing them? This single benefit will undoubtedly change my life – perhaps even save it. From what we put in our bodies, to words we speak, to issues we stand for, our lives are messages and what we do each day inspires others. I witnessed it on The Hands Free Revolution Facebook page this week. Sharing the Kindness Rocks project in a post inspired hundreds of people to form their own rock painting groups. Photo upon photo of beautiful rocks were posted in the comments. Sharing my desire to break my diet soda addiction in another post inspired hundreds of people to speak about their desire to break unhealthy habits and join me. The comment thread contained hundreds of beautiful encouragements and suggestions to me and to each other. What made me most emotional were the comments from the people who have actually found Kindness Rocks along their path. Just as my nephew suspected, that rock felt divinely planted and made the person feel happy. I’ve been thinking a lot about those who will find the rocks my family planted around Rosemary Beach three weeks ago. I think about one particular person especially—the one whose burden feels extra heavy, whose heart is especially weary, who might be thinking of ending life. I think about how he or she will spot a colorful rock in the unlikeliest of places. I think about how that rock will create a divine perspective shift—from negative thoughts to positive ones. With renewed purpose, that person will keep walking, now looking for a rock of her own to paint. She will get home and spend some time deep in thought with some paint and a paintbrush. As she thinks about what positive word or phrase to inscribe on the rock, it will be felt in her bones. And for the first time in a long time, she will remember her life is a message, and it's one worth saving. “I choose love. I choose life,” she will write on that rock. And like an excited little kid, she go outside and place that rock along her path for someone to find. And just like that, another ripple of kindness is born, reminding us that one person can make a difference – a life-saving difference. Just imagine what would happen if we all commit to keeping kindness alive? “It was just here when I got here,” people will say because kindness will start to grow like weeds. And the happy herds will keep moving together toward the light. My friends, as my family and I work through these new life messages and positive changes, I keep thinking of The Joy Plan—one woman’s 30-day pursuit to create conditions for joy. In order to make joy a top priority in her life, Kaia Roman had to remember what joy felt like. In The Joy Plan, Kaia takes our hand and shows us exactly how she did this. I was blessed and honored to read an early manuscript of this incredible book. It didn’t take long for the pages to be highlighted, starred, and dog eared. In the intro, Kaia explains that noticing how many negative thoughts she had throughout the day made her realize she really needed the Joy Plan; it wasn’t long before she realized the plan “might just save my life.” I can attest that this plan will help you reclaim lost joy, follow your instincts to step out of your comfort zone, cultivate kindness and positivity, and lose the inner critic once and for all. The Joy Plan is currently available for pre-order and releases in one week! It is undoubtedly one of the best and beneficial books I’ve ever read. Read more here. Dear ones, it is time for me to begin a substantial online break as I do each summer. Time offline is vital for my soul, my creative work, my outlook on life, and my precious relationships. As my blog and Facebook page are quiet in July, it would be so helpful to my family and me if you would pick up a copy of any of my three books: Hands Free Mama, Hands Free Life, and Only Love Today. There is a level of expression and depth of understanding presented in my books that is impossible to offer in a solitary blog post. I hope you will consider taking a deeper look at how I've stopped managing and existing and really began loving and living. If you would like visual reminders to wear or post in your home as you make your own positive changes, please see the beautiful cuffs, wrist wraps, hand-lettered prints, notecards and lunch notes based on daily intentions found in Only Love Today. Thank you for your love and support. You are so important to me. Thank you, Jenna! I can’t wait to hear about your experience! Please tell Avery that I applaud her conviction and support her 100%, because I have been a vegetarian/mostly vegan for 12 years now. Although I have loved animals all my life (I’ve had 20+ cats and 2 dogs since I was a child till now), I was 38 years old when I finally realized that eating meat did not make sense to me and did not feel right to me any more. I don’t know if I’ve inspired anyone else to change over the years, but no matter what, I have not wavered in my belief that being a vegetarian helps animals, helps the planet, and helps my health. (My doctor says my cholesterol levels are “fantastic”!) Eating vegetarian also saves money, if you cook from scratch using real, whole food ingredients. Good luck to Avery on her journey, and thank you for facilitating the change. I still get grief from my 82 year old father sometimes about my eating habits and it can be stressful. What you do to help Avery be a vegetarian will really benefit your relationship with her, but I’m sure you know that! 😉 Hugs from Seattle. Thank you for this loving affirmation. I adore your heart and your LIFE MESSAGE. It’s a beautiful one. Oh! Please tell Avery that she is not alone. My husband and I have been vegan for the last five years and understand how Avery might feel alone in a world of meat eaters. BUT a whole new wonderful planet of plant eaters are out there ready to share recipes, restaurants and to show support for their fellow vegetarians and vegans. We love Avery’s message and actions of kindness! We are so glad we’re in her universe! Also, a huge BRAVO to you, Rachel, for giving up soda. Garbage In Garbage Out. Sparkling water, tap water – find your new favorite natural healthy drink. I expect your body will start feeling better and better without those corporate chemicals. May your time away be so very restful and rejuvenating for you and your family. Enjoy your time together. Thank you, Nicole. You are so encouraging and lovely! My readers on the Facebook page told me about Bai Bubbles. I needed something to replace that fizzy goodness that I loved in my soda. Well, I tried the first one and it was delicious. I had not liked any sparkling water my husband got me to try in my last attempts to quit soda. Also, I had not liked La Croix but a reader told me about Coconut La Croix so I tried it on Tuesday and it was refreshing! I think having these alternatives will help me really stick with it this time. So much love to you. Congratulations, Avery, on making the choice that is right for you. I can see from many of the comments that you are not alone – many other children (and adults) have chosen to become vegetarians for much the same reasons. I’d like to share a story from New Zealand – right on the other side of the world from you. About a little girl (well, she was little at the time), who chose to become a vegetarian. Her Mum supported her descision – and her whole family learned about and enjoyed many great vegetarian meals. Her name is Clara Donne. Over time, Clara wanted to share her story – and help others (especially children) if they wanted to become vegetarians – and she decided to write a vegetarian cookbook especially for kids. How beautiful! We will be getting Clara’s cookbook! Avery is already cooking some of her meals and this will be so helpful. Avery’s birthday is not too far away. This may be a great gift for an 11 year old! My kids and I FOUND a rock at our local library!!!! I didn’t realize what it was at the time. On one side it said “(insert local town name) ROCKS! ” and on the other side Kindness Rocks. We didn’t take it home. We left it for others to find. It was beautiful and the kids loved it! Maybe we will paint and plant our own. Thank you for the inspiration! I love this!!! Thank you, Rebecca! Keep KINDNESS ALIVE! How proud you must be of Avery for making a loving and well thought out decision. I love that you support her decision. I believe that she can absolutely make a big difference. I’m not a vegetarian or vegan but hardly ever eat red meat at all and rarely eat poultry, never fish (I don’t like fish.) After reading a book written by the CEO of the Humane Society “The Bond:Our Kinship with Animals, Our Call to Defend Them” last summer I’ll only eat chicken (once every few months) and only if it is free range or labeled humanely treated. Avery has motivated me further to totally eliminate chicken all together. Congratulations on eliminating soda!! Many years ago I drank bottled ice tea by the gallon a day. I stopped doing that and replaced it with water instead. About 6 months later I made a quick stop at a drug store and grabbed a bottled ice tea on the run. I could taste the chemicals and it tasted disgusting. I couldn’t believe I had been drinking it all that time and never noticed it before. Rachel, if you decide to start drinking more water instead, try adding squeezed fresh lemon (or lime) into the water. I use a strainer to stop the seeds from getting into the water. It is so good!! Healthy too. 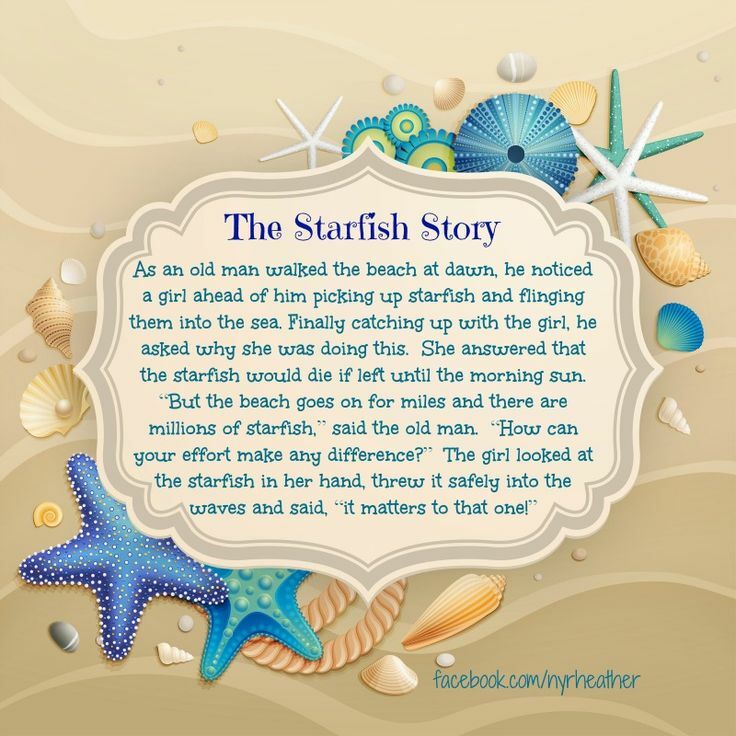 Do you know the starfish story? When I read this, it came to mind. First of all, EVERY blog post of your’s touches me in some profound, deep way, and I am in tears by the end!! So thank you for that. I have been a vegetarian for over 25 years. There is a book called Diet for a Small Planet (it may be out of print) that explains how being a vegetarian can have a positive impact on the world. It looks at things more from an environmental rather than animal rights, but it is partly what convinced me to become a vegetarian. I am doing my small part to help the world! Rachel, I realize you’ll be on your blogging break by now, but I wanted to take a moment to say that I’m grateful to you for sharing (and living!) this story. Your response to Avery’s decision was so supportive and compassionate; she is fortunate to have you as a parent! And I love that thanks to you, Avery is empowered to live in integrity with what she believes. In fact, you can tell her that she has given me the courage to be more open about my own recent shift to a plant-based diet. It started off as a way to deal with chronic health conditions and just feel better physically, but it has become more than that. Now I’m thinking about food choices as a way to connect with my heart for animals and for people, as you wrote about here. Still, I’ve been really shy about sharing these changes with others because I’m afraid that they’ll judge (or think that I’m judging them). But reading about you and Avery helped to free me up … right in time for a family vacation! What a sensitive human being you’re raising. Not only to think about the animals in that bucket, but how they might be separated from their herd is amazing. My, how the world needs more of her… and you! Everyone needs to hear that their life is a message. Every act that we do is so important and it’s so important for kids to hear this and internalize this. You gave your daughter a beautiful lesson for life. Just imagine how every child would grow up knowing that everything that they do sends a message to others! My favorite vegan cookbooks that include kid-friendly recipes are Oh She Glows by Angela Lidden and Plant-Powered Families by Dreena Burton. My 3 teenage daughters will eat most of those recipes. Good luck! Wonderful! Thank you! I will order it right away! I recently discovered your blog and am grateful. Reading about the care and attention you are giving to your children inspires me. Since reading several of your articles, my internal priorities have shifted. I see now that that the most important thing for me is to be fully present and engaged with my children throughout their brief and precious childhood. Thank you, Neve! This means so much to me! I appreciate you letting me know. Many blessings! This is really very entertaining! I have two children five-year-old son and four-year-old daughter. They would have loved this journey too! I get inspiration the way you take care your children. Simply amazing! Thanks for sharing your amazing vacation.